A Weekend with Love in the Garden, Beer for Furry Friends, and a Music Fest! City Park is the place to be this weekend - with two exciting events going on! Tonight it's Love in the Garden - In the beautiful Besthoff Sculpture Garden - There's music with Sasha Masakowski, John Boutte, and dance into the evening with DJ Soul Sister. Plus enjoy lovely libations and incredible food from 40 restaurants around town - You couldn't ask for more!! See below for all the details and click on "Love" for even more information!! Tomorrow drink beer for the pups and the kittens!! Celebrate with the Bulldog and LA/SPCA's its the Third Annual New Orleans on Tap Beer Festival Sponsored by Abita Brewing Company. Saturday at City Park by the Big Lake Boathouse from 1:00 pm to 6:00 pm. A beer tasting like no other! Sample a menu of 200+ beers while sitting under an oak tree in historic New Orleans City Park and enjoying live music by New Orleans Nightcrawlers and Billy Iuso & Restless Natives. There's plenty of shade, food and non-beer drinks including sodas, wine and margaritas. The best part of sampling all this beer is, you will be helping out the Louisiana SPCA while having an awesome time. Click "beer" for more info!! And there's two days of music in Lafayette Square - NOLA Downtown Music and Arts Festival! For more info on the fest click - "music"! 8:50 The Way Road: All Good Things – Short film by Michael Hofstedt on musician John Petty’s development as an artist. Happy Thursday - Show Your Support for Devon Walker Tonight! Come show your support for Devon Walker tonight at 8:00 pm! Mardi Gras World will be the site of the Devon Walker Benefit!! A $20 donation will be collected at the entrance ($10 for students), but of course larger donations are welcomed and encouraged. All donations will go to Devon's medical bills. While helping Devon and his family through this difficult time, guests can also enjoy music and catering by local restaurants. You will also be able to purchase T-shirts and charm bracelets with Devon’s number will be on sale. And there's more wine!! Come to Tastings at the Track and celebrate a "Wine Tasting...European Connections: Great Wines from Europe"! The reception-style tasting will feature more than 35 fine red, white, rosé and sparkling wines made in the USA. Held from 6:00 to 8:00 p.m. in the clubhouse at Fair Grounds Race Course and Slots (1751 Gentilly Blvd. ), the spirited sampling is sponsored by Dorignac's. Wine experts are on hand to answer all of your wine questions, and there will be gourmet cheeses to compliment the wines. Cost to attend is $25 per person. Tickets are sold at Dorignac's or at the door. Don't miss it! Jazz in the Park Free Concert Series kicks off this evening in Armstrong Park! PUfAP is proud to present the 2012 second season of Jazz in the Park, inside of the historic Louis Armstrong Park. The events are FREE, begins today and runs from 5:00 to 8:00 pm for seven Thursdays until November 1st featuring a Marketplace that provides an opportunity to purchase fresh food, produce and craft market available to the public from 3:00 to 7:00 PM. Check out the great line-up of music below! Need a little art, culture and music? You gotta go to the show at the Ogden Southern Museum of Art (925 Camp St.) - better known as Ogden after Hours. Tonight the Ogden presents Billy Iuso -"Don't miss the opportunity to be inspired" is Billy Iuso's mission. Three decades after honing his skills, he is widely known for his funk-driven jam sound with Brides of Jesus and The Restless Natives! Tonight the O BAR's specialty drink is Lemonade with a Twist -- Celebrate the last hot days of summer weather with this refreshing mix of lemonade and mango juices with vodka. *Remember with your Ogden membership all of these excellent concerts are FREE!! Happy Wednesday - The Doctor is in the House (or the Square)! Opera returns to Bourbon Street with Opera on Tap - Fall is here - Celebrate with song, wine, and the New Orleans Opera Association Vocalists with Pianist Todd Simmons! Join in tonight at 7:00 pm at the Puccini Bar located at the Four Points Sheraton on Bourbon (formerly the Inn on Bourbon - 541 Bourbon)! The hotel is located at the site of the French Opera House (1859-1919) and continues to celebrate its history with a live performance series. Special $5 parking is extended to all guests attending the performances. Have fun in Mid-City when you head on over to Chickie Wah Wah (2828 Canal) for some happy hour drinks and stay on for Meschiya Lake & Tom McDermott at 7:00 pm and stay on for Copper Box at 9:30! Come hungry - the kitchen is kickin' with pizza and all kinds of yummy food! Looking for some dinner and then some music for dessert? Rock 'N Bowl (3016 S. Carrollton) can help you out! Get an entree' over at Ye Olde College Inn and then get a half price ticket to the show right next door at Rock N' Bowl....Tonight enjoy piano man Joe Krown at 8:30 pm!! You can get your day started off right with a trip to the Farmer's Market! Visit the Crescent City's Farmer's Market at University Square (200 Broadway) from 9:00 am to 1:00 pm for the freshest veggies, fruits and seafood. Today for the Green Plate Special come out and meet Chef Matt Farmer and the staff of Apolline as they serve up sweet potato and andouille bisque, pulled pork tacos with queso fresco, pickled red onion, cilantro and spanish rice (veggie-friendly option also available), and strawberry Arnold Palmers....Yum! Right down the street the Spotted Cat (623 Frenchmen) has a triple header with no cover - Andy Forest at 4:00 pm, Smokin' Time Jazz Club at 6:00 pm, and top off the evening with the Aurora and the Royal Roses at 10:00 pm! Happy Monday - Sunday's game was pretty depressing - so, get out and cheer up with some good stuff going on around town! And while your Uptown - Enjoy some cocktail porch sippin' over at the Columns Hotel (3811 St. Charles)....Tonight Don Vappie performs at 8:00 pm! Happy Friday with Wine, Beer, Rum, & a Concert in the Courtyard! There's wine on the Bayou! It's Vino on the Bayou at The Pitot House (1440 Moss St.) from 5:30 to 7:30 pm. Come enjoy wine tasting event of the Fall season. Come enjoy a glass of wine and the live music of T.J.B. (Traditional Jazz Band) while watching the sunset on Bayou St. John. $5 admission for Louisiana Landmarks Society members and $10 general admission. Wine selections are donated by Cork & Bottle Fine Wines, located in the American Can Company on Orleans Ave.
And there's beer!! It's the Lower Garden District Fall Fest Pub Crawl (oh...just go ahead and call it the Irish Channel - Geez!!) starting up at 5:30 pm! Enjoy pre-release Abita Fall Fest! Join us for Abita’s version of organized bar-hopping. You and hundreds of friends stroll from bar to bar, score a Pub Crawl t-shirt and appreciate the finer qualities of Abita Beer. $2 Abita Fall Fest at all locations. First 500 people receive a free t-shirt. *Start the party at : 5:30 pm – 7:00 pm Registration - Half Moon Bar & Grill (1921 St. Mary Street)...Then make your way to at 7:00 pm to Down the Hatch (9121 Sophie Wright Place) and finish the party at 8:30pm over at The Saint Bar & Lounge (961 St. Mary Street). Pre-register for the crawl at www.abita.com. And there's some rum celebrating with Spirit Tastings at the Track - "Bacardi Bash: 150 Years of Fine Rum" at the Fair Grounds from 6:00 to 8:00 pm 4th Floor Clubhouse * $25 per person - This spirited event will feature the iconic rum brand in celebration of Bacardi's anniversary. Cocktails to be sampled include classics such as the pina colada and cuba libre; Bacardi Solera and Anejo straight from the plant in Mexico; Oak Heart and Bacardi 8 year old Rum straight from the barrel; unique Bacardi flavors, hand crafted original recipes; and a "How To Mojito" station. Guests will also enjoy live music and light hors d'oeuvres. Head down to the Quarter for the spring season finale performance for Concerts in the Courtyard at the Historic New Orleans Collection....Experience a concert in the courtyard at the Historic New Orleans Collection in the heart of the French Quarter - 533 Royal Street. The fall series opens Friday, September 21, with a performance by pianist Paul Soniat with guitarist John Rankin! Admission is $10, FREE for THNOC members, and includes 3 complimentary adult beverages! Guests must be 21 or older to enter and memberships begin at the low low price of $35.00 per person. Enjoy a Night at the Museum! Check out The Where Y'Art? 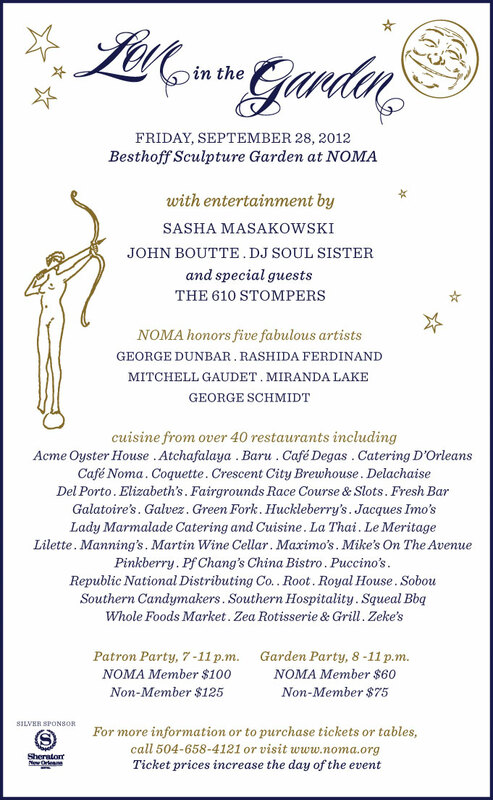 party this evening over at the New Orleans Museum of Art beginning at 5:00 pm and celebrate the weekend! The event is FREE with museum admissions. $10 Adults, $8 seniors, students, active military, $6 children ages 17 to 7, children 6 and under are free. Need a little art, culture and music? You gotta go to the show at the Ogden Southern Museum of Art (925 Camp St.) - better known as Ogden after Hours. Tonight the Ogden presents Nasimiyu Murumba is a singer, songwriter, pianist and performer. Her original music, which she composes, arranges, and produces herself, is a mix of rootsy folk, pop and forward-looking contemporary soul, influenced by her own travels and experiences as well as the deep musical heritage of New Orleans, her adopted home. She is a resident of the Crescent City, but a citizen of the world.! Tonight the O BAR's specialty drink is Lemonade with a Twist -- Celebrate the last hot days of summer weather with this refreshing mix of lemonade and mango juices with vodka. Happy Wednesday w/the Kick-off of Harvest the Music & Lots More Fun! Check it out..... It's the start of the 2011 HARVEST THE MUSIC CONCERT SERIES!!! A free concert series benefiting Second Harvest Food Bank of Greater New Orleans & Acadiana....Every WEDNESDAY, September 19 - October 24 from 5:00 pm to 7:30 pm at LAFAYETTE SQUARE!! Come visit Dijon (1379 Annunciation) for FREE Wine Wednesdays from 5:30 to 7:00. We love wine! Have fun in Mid-City when you head on over to Chickie Wah Wah (2828 Canal) for some happy hour drinks and stay on for Meschiya Lake & Tom McDermott at 7:00 pm and stay and swing out with April Mae and the June Bugs at 9:30! Come hungry - the kitchen is kickin' with pizza and all kinds of yummy food! Looking for some dinner and then some music for dessert? Rock 'N Bowl (3016 S. Carrollton) can help you out! Get an entree' over at Ye Olde College Inn and then get a half price ticket to the show right next door at Rock N' Bowl....Tonight enjoy the Latin sounds of Santiago at 8:30 pm!! You can get your day started off right with a trip to the Farmer's Market! Visit the Crescent City's Farmer's Market at University Square (200 Broadway) from 9:00 am to 1:00 pm for the freshest veggies, fruits and seafood. Today for the Green Plate Special come out and meet Chef Matt Farmer and the staff of Apolline as they serve up heirloom tomato salad with frisée, arugula and feta, lamb bolognese over pasta with carrots and shaved Piave cheese (plus a vegetarian pasta option), and blueberry basil fizzes....Yum! FREE CONCERT - Head on over to Dixon Hall on Tulane's Campus tonight for a free concert with Ellis Marsalis! Mr. Marsalis is the patriarch of one of New Orleans' most renowned musical families, and is regarded as the premier modern Jazz pianist in the City. Don't miss the chance to see a Jazz legend in this beautiful venue! There's a great musical evening on the Avenue at the The Columns (3811 St. Charles Ave.) at 8:00 p.m. tonight! Have a fancy cocktail and listen to the guitar sounds of John Rankin Trio with Clarence Johnson III on sax and Tim Paco on bass. Right down the street the Spotted Cat (623 Frenchmen) has a triple header with no cover - Andy Forest at 4:00 pm, Meschiya Lake and Little Big Horns at 6:00 pm, and top off the evening with the Aurora and the Royal Roses at 10:00 pm! Celebratin' Monday with a Little Erin Go Braugh & More! Don't let the Saints loss get you down this rainy Monday - Just start celebrating St. Patrick's Day 6 months early! Can you believe?? It's already halfway to St. Patrick's Day!! So go on and celebrate at Pat O'Brien's (718 St. Peter) with the Halfway to Saint Patrick's Day Party! Join the fun with live music, drink specials, Irish food, giveaways and a great time! And while your down there head right across the street to the Boondock Saint (731 St. Peter) for some great drinks and free red beans and rice! Keep the Irish fun going over at Kerry Irish Pub (331 Decatur) - it's an evening with Beth Patterson and Patrick O'Flaherty at 8:00 pm - Erin go Braugh! TGIF with Wine, Suporting Live Local Music, Hurricane Relief and More! Hooray for wine! It's the weekly wine tasting over at Cork & Bottle (Orleans at Moss St.) - from 5:00 to 7:00 pm. Come out and sample some fantastic wines! Also, please read the statement below from the owners of Cork and Bottle and Clever Wine Bar - Help support LIVE LOCAL MUSIC in NOLA!! For those of you who are fans of Scott Sanders, Evan Christopher, Brent Melancon, Riccardo Crespo, DeSoto Street Band and all the other free music that clever has provided to mid-city for free over the last couple of years, you should know that the city has cracked down on music venues and apparently there is a moratorium on live music in this area. With Isaac knocking us out for a few days, we're hard pressed to come up with the fee to appeal (which is no guarantee that we'll receive the license) and then there's the license fee on top of that. So, our loss is your potential win. We're going to be raffling off a mixed case of wine guaranteed to be worth over $100 for the next three weeks. Tickets will be available in the store and the bar, and the drawings will be held on Monday for each of the next three weeks. Also, if you are so inclined to do so, please contact Susan Guidry, Stacy Head and Patricia Clarkson with the City Council and tell them you would like to see clever get their music license. The City Planning Commission has arbitrarily placed this moratorium on the area, and this has affected not only us but other businesses. This could happen to you. Double your wine tasting pleasure in Mid-City! Check out Swirl located on Ponce de Leon right off Esplanade and enjoy a FREE wine tasting at 6:00 pm. .. Plus the folks at Swirl will be dishing out his fabulous small plates ranging from $5-$7. Check out The Where Y'Art? 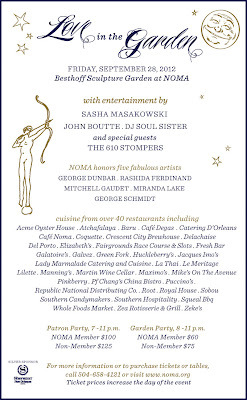 party this evening over at the New Orleans Museum of Art beginning at 5:00 pm and celebrate the weekend! The event is FREE with museum admissions. NOMA celebrates two exhibitions: Dario Robleto: The Prelives of the Blues (on view until Sept. 16th) and Photography, Sequence, & Time (on view from Sept. 7th until Dec. 2nd). $10 Adults, $8 seniors, students, active military, $6 children ages 17 to 7, children 6 and under are free. Concert 4 Flood Relief!! Tipitina's (501 Napoloen) is proud to partner with WWLTV in a benefit concert to support those affected by Hurricane Isaac. This concert will benefit Second Harvest Food Bank and United Way. Tickets are available at the door on the night of the show. Check out the line-up!! Mia Borders, Stooges Brass Band, Honey Island Swamp Band and Red Baraat!! Get on over to Chickie Wah Wah (2828 Canal) Stop by after work for happy hour with Kelcy Mae at 5:30....and keep the party going with Debbie Davis at 8! Be sure to come hungry for delicious pizza and more! And there's more good music in Mid-City (almost Uptown) over at Rock 'N Bowl (3016 S. Carrollton) with Amanda Shaw at 9:30 pm!! Remember if you eat at Ye Olde College Inn right next door you get a discount to the show! Happy rockin' and bowlin'! Let the Carousel Lounge in the Monteleone Bar (214 Royal) spin you around with some happy hour music with the Matt Lemmler with Robin Barnes at 5:00 then the swinging sounds of Lena Prima at 9:00 pm. It's a cool place for some fun and fancy cocktails! You can get started early at the Spotted Cat (623 Frenchmen) with Ben Polcer at 4:00 pm, Jayna Morgan at 6:00 pm, and the New Orleans Cottonmouth Kings at 10:00 pm. d.b.a. 's (618 Frenchmen) got a double header with Louisiana Hellbenders at 6:00 pm, and stay on for the Good Enough for Good Times at 10:00 pm...there's only a $10 cover! Happy Thursday with Wine, Opera, Cajun Music & the Honeypots! Need a little art, culture and music? You gotta go to the show at the Ogden Southern Museum of Art (925 Camp St.) - better known as Ogden after Hours. Tonight the Ogden presents Caleb Elliot with Sam Broussard - Caleb mixes guitar, cello and voice, performing original songs that are worldly but still feel like home. For this show, Grammy-nominated guitarist, vocalist and singer/songwriter Sam Broussard of Steve Riley & The Mamou Playboys will appear with Elliot! Tonight the O BAR's specialty drink is Lemonade with a Twist -- Celebrate the last hot days of summer weather with this refreshing mix of lemonade and mango juices with vodka. Top off your evening at Chickie Wah Wah (2828 Canal) for the Honeypots at 8:00 pm! They'll have their CD, "Something Sweet" available. Mississippi Honeypot, Lynn Drury will also be playing a duo set with fellow Threadhead Records artist Marc Stone too! And party with Margie as she celebrates her big birthday month! A Wednesday with a Market, Culture, Wine and Music! Head on over to Lakeview and the Harrison Avenue Marketplace presented by Beacon of Hope tonight from 5:00 pm to 8:30 pm in the parking lot of Lakeview Grocery at 801 Harrison Avenue. You'll enjoy music by The Scott Schmidt Band and there will be 75 arts, crafts and food vendors! ParTee Rentals will be there with great activities for the little ones. You can enjoy the famous char-grilled oysters from Drago's or Baked Alaska from Antoine's. Stop by the Beacon Beverage booth to enjoy a refreshing libation from an array of thirst quenchers. Try the new Velvet Cactus Margarita-frozen or on the rocks! Come visit Dijon (1379 Annunciation) for FREE Wine Wednesdays from 5:30 to 7:00. This week will feature wines from Lirette Selections which will pour a Domain Bernard Moureau Bourgogne Rouge, Domain Bernard Moreau Bourgogne Blanc, Tami Grillo, and Langlois Crement de Loire Sparkling Rose - we love wine! Have fun in Mid-City when you head on over to Chickie Wah Wah (2828 Canal) for some happy hour drinks and stay on for Meschiya Lake & Tom McDermott at 7:00 pm. Come hungry - the kitchen is kickin' with pizza and all kinds of yummy food! Looking for some dinner and then some music for dessert? Rock 'N Bowl (3016 S. Carrollton) can help you out! Get an entree' over at Ye Olde College Inn and then get a half price ticket to the show right next door at Rock N' Bowl....Tonight enjoy some swingin' music with Jerry Embree and his band at 8:30 pm!! Happy beautiful Monday - Get out there and enjoy this lovely day! Yum - start your week off right with some amazine food!! It's the annual We Live to Eat: Louisiana Seafood Restaurant Week Gourmet 2-Course $20 Lunches and 3-Course $35 Dinners from September 10th thru the 16th! *Enjoy special $20 two-course, prix-fixe lunches and $35 three-course, prix-fixe dinners at participating restaurants. Click the link above for all the details!! Tonight is Culture Collsion 2012 and the opening of the New Orleans cultural season! The party starts at 5:30 pm over at Generations Hall (310 Andrew Higgins) and admission is free. There will be plenty of delicious complimentary food with cash bars throughout. The After-Party tradition continues this year a step away in the Big Room at Generations Hall beginning at 8:00 - where you’ll get to see the captivating Ratty Scurvics perform. Culture Collision 2012 is hosted by WWNO, Sponsored by OffBeat, Generations Hall and Canary Collective. It is organized by the Arts Council of New Orleans, Louisiana Philharmonic Orchestra, Loyola University Montage Series, New Orleans Ballet Association, New Orleans Museum of Art, New Orleans Opera Association, the Ogden Museum of Southern Art and Southern Rep. Don't miss this super night of culture!!! Have fun in Mid-City when you head on over to Chickie Wah Wah (2828 Canal) for some happy hour drinks and stay on for Aurora Nealand and Tom McDermott at 8:00 pm. Come hungry - the kitchen is kickin' with pizza and all kinds of yummy food! Restocking Some Fresh Veggies on Tuesday and Music to Take Your Cares Away! Hope everyone is okay, back on the electrical grid (and if not I hope ya'll get the power today). I really can't eat another can of Chef Boyardee, so let's go shopping for some fresh veggies today! You can get your day started off right with a trip to the Farmer's Market!!! Visit the Crescent City's Farmer's Market at University Square (200 Broadway) from 9:00 am to 1:00 pm for the freshest veggies, fruits and seafood. Today for the Green Plate Special they welcome New Orleans' first and only solar-electric food truck, Empanada Intifada. Look forward to empanadas and all kinds of delicious South American favorites......Yum! There's a great musical evening on the Avenue at the The Columns (3811 St. Charles Ave.) at 8:00 p.m. tonight! Have a fancy cocktail and listen to the guitar sounds of John Rankin with Todd Duke. Right down the street the Spotted Cat (623 Frenchmen) has a triple header with no cover - Andy Forest at 4:00 pm, Shotgun Jazz Band at 6:00 pm, and top off the evening with the Smokin' Time Jazz Club at 10:00 pm!